The second attempt at the Lands End to Broadstairs Ride had been a long time in planning: it was due to start on 3rd May 2001, but the Foot & Mouth outbreak finally resulted in it being abandoned the week before the start. I had got everything prepared - even buying not only another bicycle but also a lot of photographic equipment to record the event. For the record, the chosen bike for the ride was a Moulton Jubilee L; cameras were to be all digital - my Nikon Coolpix 990 with the older Coolpix 900 in reserve, plus about 200M of storage, and computer equipment (to write reports as we went along) was to be the Compaq iPAQ, Stowaway keyboard and memory cards shared with the camera. The cancellation of this ride left me feeling rather depressed, and wondering how to find something enjoyable to fill in 2 weeks or so. I needn't have worried, though. On 1st May I received a telephone call from Graham McDermott, asking if I was interested in a ride/photographic expedition in Scotland, starting on 8th May: Peter Evans, who was to have accompanied Graham, had had to cry off due to health problems. While feeling suitably sorry for Peter, I was delighted to accept the offer. However, Graham made clear that the priority was photography rather than cycling - no hardship for an enthusiastic photographer like myself, but this called for a complete re-appraisal of the equipment required. For Lanstair, the AM was chosen partly for compatibility with most of the other riders, and photographic gear was of secondary importance. For the revised plan, photographic gear was the priority (perhaps mistakenly - see final conclusions), and as Graham would of course be riding his new Moulton New Series Speed ('Pylon'), it seemed sensible to use my own New Series as well - that way more spares, and tyres in particular, could be shared. While the revised choice of cycles was relatively simple, the computer and photographic gear were more difficult to select. The choice of the iPAQ for the Lanstair Ride was partly governed by its compatibility (via CF card) with the digital cameras, and especially its 'killer application', Pocket Artist. However, with a conventional film camera much more suitable for a predominantly photographic holiday, this feature was no longer so critical, and for weight/size/features, I chose to take the old Psion Series 5mx instead - a great machine, apart from the dismal low-contrast monochrome screen - a serious problem with my failing eyesight, and pretty poor even for those with perfect vision. One wonders if Psion will survive much longer in view of their failure to address this issue, and the increasingly dated specification of their hardware and software in general - a shame, as it still has many features which leave the competition behind. Cycle and computer sorted, but what photographic gear to take? I changed my mind almost daily (sometimes several times a day) in the lead up to the ride. Although a Bronica ETRSi with 3 lenses, 1.4 converter, prism and a second back remained favourite for most of the time, the weight and bulk were a serious concern - about 2.5 Kg (6 pounds) heavier than an equivalent Pentax 35mm outfit. Even purchasing a carbon fibre tripod - nearly £400 for 3 carbon fibre legs makes a Moulton 'Pylon' with 2 carbon fibre forks and a lot more mechanical equipment look quite cheap - didn't really make the weight all that acceptable. Although the Moulton racks and bags are probably the lightest system around - and it's surprising and frightening just how much weight racks and bags add, even without anything on/in them - I was still concerned about the weight. I certainly would not have dared carry this much on a serious cycling holiday, but Graham had assured me that this was to be primarily a photographic holiday, so it deserved considering. Finally, the day before departure, I came to the conclusion that I just could not face the extra weight of the Bronicas, and switched to a Pentax system - MZ5N, Z1, 4 prime lenses and a 70 - 210 zoom. In the end the weight saving was about 2 Kg, and in addition the volume was reduced to the point where everything fitted reasonably comfortably in the Moulton rear bag. 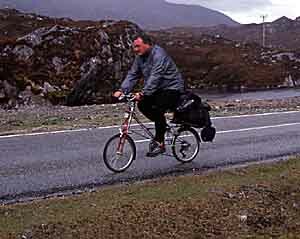 Although my choice of equipment probably resulted in more soul searching, Graham's options were at least as wide as mine, and his choice was more exotic - the Moulton New Series Speed ('Pylon'), a Hasselblad XPAN and Fuji GA645, and a Compaq iPAQ computer/organiser. 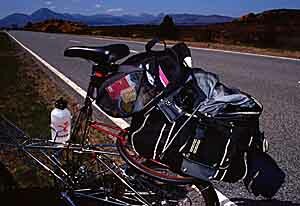 Luggage would be divided between the large Moulton rear bag and a Carradice SQR bag for the items to which access was needed more quickly. The photograph shows the rear of Graham's Pylon, with rear carrier and bag, the Carradice SQR bag and a spare tyre. An examination of the train times revealed that in order to connect with Graham at York, I needed a train from Birmingham New Street at 10:45 on 8th. Now normally that would be quite straightforward, and it was only by luck that I checked on the connection from Tipton - I know the trains from there to New Street by heart - and discovered that there were no trains to New Street that day! Thus I had to cycle the 16 Km at the start - not far, but fully laden, and with the worry of what would happen if I punctured, or how unpleasant it would be if it was wet. Anyway, on the day I allowed myself 1.5 hours instead of the usual, very generous, 1 hour, to get to New Street, and set off with the NS, Psion, Pentaxes, a single change of clothes, and a basic set of tools for the bike: I did include a spare tyre, and Graham was taking one as well - not only are Continental GPs difficult to come by, but my front tyre, though still showing plenty of rubber on the main tread, was looking a bit ragged around the side walls (see photograph at the end of the report)- a problem the Continental GP in 406 size seems to share with the Primo Comet 349, which also seems to have insufficient rubber in this area. I had packed all the gear, apart from the tripod, inside the rear bag, and the tripod was bungeed on the top. On the morning of 8th the weather was beautiful, and the weather forecast, at least for the next few days, was excellent. However, I had a premonition of getting a puncture before I gone far, so, just in case, I left the Jubilee L set up ready for a quick change if this did happen and I had to return home for a change of bike. I must say I have never felt like this before, nor felt compelled to prepare a second bike as a standby for such an eventuality. Well, I got 3.5Km before disaster struck, which was really too far to be able to get back home, change bikes, and then get to New Street on time. Also, the disaster was, at least potentially, more major than a puncture. As I rode over a manhole cover - rough, but nothing too special - there was a crack followed by a rattling, flapping noise. As I slowed I glanced down and saw the front mudguard flapping about. When I stopped, I could see that it had broken away from the rear struts and was badly bent both at the top and bottom. There was no option but to take it off, which necessitated taking the front wheel out. The mudguard was clearly scrap, but I put it in the bag to show to Graham later. As I continued without the mudguard, I thought back to my earlier premonition, but also to the fact that I had decided at the last minute, in view of the weather, to wear shoes rather than boots, so that if it got wet later I was really going to suffer without a front mudguard. At least I should count myself very lucky that the mudguard had not jammed the wheel and brought me off. 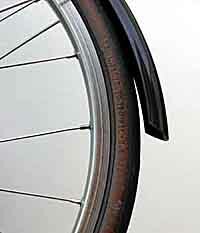 Front mudguard failures are pretty frightening and could result in some very nasty damage. A further 5 Km, and the main road was completely closed, resulting in an unsignposted diversion, during which I got lost and began to have serious worries about whether I would catch the train. In the end I had 20 minutes to spare. The train arrived early, allowing plenty of time to load the bike in the luggage van and seat myself. Happily we also left on time, and apart from a short delay outside Leeds, there were no worries about whether the train would arrive at York in time for the connection with Graham's train. My train arrived at York on time at 13:15, and Graham's was due to arrive there at 14:02, although in the event it was about 10 minutes late. The station staff had directed me to the correct end of the train, but as the luggage space was already full with 4 cycles, including a tandem, my NS was relegated to the additional luggage space in the front power car. Then it was just a case of making my way down the train to located Graham, and settling back to enjoy the journey. By the time we reached Inverness, we had made up all the time lost earlier in the journey, and in glorious sunshine we made our way to the B&B, 13 Bishops Road, where we received a warm welcome, and the bikes were securely locked in a garage for the night. The overnight accommodation and breakfast were excellent, though when I got up at the unaccustomed late hour of 06:30 I was unable to get out for a walk and photography - no real loss as it was a rather grey morning at that stage, though with no sign of rain. The train from Inverness to Kyle of Lochalsh left at 08:55 (there had been no spaces available for the bikes on later trains), so there was not time for looking around before our departure. The train ran to time through beautiful scenery, and the nearby road looked very tempting - I think I shall repeat the journey some time, but ride from Inverness to Kyle of Lochalsh. At Kyle we took a few pictures and had light refreshments before setting off across the bridge to Skye. A brief halt was called half way across so that Graham could photograph me in action. From there we went to take a look at the old ferry terminal and the remains of the castle, and then set off on a leisurely ride to Broadford (not of course to be confused with Bradford! ), where we were due to stay overnight. Our leisurely ride along the very quiet A87 was punctuated by stops to take photographs. We arrived there by very early afternoon, so decided to ride along the B8083 towards Elgol. There were a number of stops to take photographs, some ruins of a church proving particularly attractive despite the strong light prevailing in mid afternoon (see photograph right), so we only got as far as Loch Slapin before turning back. The weather was absolutely outstanding, although a little grey for the first hour of the train journey, but after that we had continuous sun, and it was warm, without being uncomfortably hot, and there was little or no wind. Finding the B&B in Broadford turned out to be easier than we expected, as it was actually on the B8083 just as we rode back into Broadford. At this point I discovered my lock was missing - Graham's guess was that I had left it at the ruined church, but I thought it might have gone missing earlier. It didn't seem worth retracing the whole day's journey just in the hope of finding it, so we went and had an excellent meal in Broadford. As I walked back to the B&B at 8:30, I decided to walk a bit further in the hope of just possibly finding the lock, especially as I still felt I needed some exercise (especially to work off the large meal) and it was still light. I eventually got to the ruined church, and by a spot of good fortune found the lock was indeed there, just where we had stopped on the way back. The walk added about 8km to my day's tally of 34.5Km on the bike. Breakfast at 8:30 the following morning left time for a short walk beforehand. I had my usual light breakfast of orange juice, muesli, toast and marmalade and coffee, but Graham decided to enter into the spirit of things and opted for a substantial helping of porridge followed by bacon and eggs. A start just after 9:00 still left plenty of time for the ride to Portree, and time for photography. The ride was excellent, especially the side road along Loch Ainort, where just as we rejoined the main A87 we were able to stop for welcome refreshments at the golf course. The scenery and the superb, sunny, weather certainly made for enjoyable cycling, though neither the lighting nor the scenery was particularly attractive photographically, but we stopped quite frequently just to enjoy the conditions. Even so, we reached Portree at the relatively early hour of 1:30.Feeling fit for a bit more cycling, I went along the B885 towards Struan, before turning off to the right along a side road and rejoining the A850 to return to Portree. The countryside made cycling a joy, but although we stopped several times to absorb the atmosphere, the photographic opportunities were somewhat limited. Again the conditions were beautiful for cycling, sunny and quite warm, but not unpleasantly hot, and only a light breeze at times. Back in Portree we took a few pictures down at the harbour (see picture below), and then booked ourselves into the hotel. With the additional afternoon ride, I recorded 66.7Km for the day. Portree - you can't get away from A2B anywhere! The hotel had its heating on, despite the weather, and this and the rather noisy location made it rather difficult to sleep. This, combined with the rather basic rooms, made it the least comfortable, and most expensive night so far, though the food was excellent. In the morning there was time for some early photographs of the harbour before a short shopping session - the effect of the sun on limbs which were being exposed for the first time in the year had had rather painful results, and in addition we both decided to buy more film. Friday's ride involved following the A855 to Duntulm Castle, where we were booked into the hotel. Again the weather was hot and sunny, though a haze did affect visibility of some of the mountains - at least in terms of photographic opportunities. Nevertheless, we stopped several times to take pictures along the way. The amount of traffic was amazingly light, especially for an A road, and although the countryside is quite hilly, most of the climbing was relatively gentle - I didn't engage bottom gear once on the road, and never found the climbs tiring, despite having done little cycling this year. Of course the distance involved was quite low at only 45Km. We made a particularly good stop at about 11:30 for light refreshment at the Glenview Inn, where we had a most interesting chat to the owner, who is a keen photographer, and who had prints on display and on sale in the restaurant. Furthermore, he pointed us to the Three Herons Gallery just 300m further along the road, where there was another keen photographer and artist. Here we found some superb prints, and were only prevented from making purchases by the difficulty of carrying such things on the bikes. However, we may well end up buying prints on our return after visiting their web site.. We continued on our way from there to Duntulm, making fairly regular photographic stops, especially when Graham was overcome with what he came to call an "XPAN moment" - a view particularly suited to the panoramic format of his Hasselblad XPAN camera. As the road was getting more hilly, such stops to take photographs and savour the views and the air, were very welcome. The hotel, in beautiful surroundings with a superb view, was reached at abut 4:00pm, and after some slight concern as to whether they were open - the back rather than the front of the building faces the road, we were soon settled in and enjoying the view. Immense entertainment was soon forthcoming with the arrival of three club photographers in a car, heavily laden with gadget bags, cameras and tripods. The group spent a lot of time sitting discussing photography, and their planned assignment to take sunset photographs of the bay later, but showed little inclination to get out their cameras and look for any other pictures, or even recce the location before hand. Graham and I had been planning to take some sunset pictures too, but the antics of this group rather put us off the idea, or at least of doing it in an ostentatious way. In the event, cloud and mist meant that apart from some attractive golden reflections in the sea, there was no sunset spectacular sunset at all, which was not really a great loss for Graham and myself, but must have been a let down for the photographers - I must admit that I felt an unkind amusement at this! During the evening we had an unpleasant surprise, because it became evident that our plans to take a ferry in Uig to Tarbert the next day were based on a misunderstanding of the timetable. The early, 9:50, ferry would be difficult to reach in time, with the need to book in 30 minutes before sailing, and there was no other sailing until 6:20 in the evening. After some considerable discussion we decided that it would be better to aim for the evening sailing, though that meant replanning how to spend the day up till then. Saturday morning dawned with no spectacular sunrises (I did look out just in case), so the photographers must have been very disappointed. It was also rather grey and much cooler first thing, and indeed when I first went out there was a faint drizzle in the air, which prompted me to go back and get the shower cap I use as a saddle protector. After breakfast, we decided that as the ferry did not leave until 6:20, I would cycle back to Staffin and then take a minor road over the mountain to Uig, while Graham opted for the slightly shorter and apparently less hilly route along the A855, and would leave a little later. I missed the turning at Staffin, and had to turn back after adding a couple of kilometres to the distance, and it was quite a climb up on the side road via Quiraing. I was in bottom gear for a fair part of the climb, and the steepest part, the last 200m or so, reduced me to pushing - I might have managed it with a less load on the bike. About this time the grey weather began to show real signs of improving. A couple of short spells of light drizzle had persuaded me to put on a waterproof jacket at one stage, but fortunately they had finished and I was able to dispense with the jacket for the strenuous climb. From here the riding was easy, though the heathland was not especially attractive, certainly not photographically, and the net photo opportunity was not to occur until the road joined the A855 just before Uig. I had just stopped at a conveniently placed bench there and had taken a quick look at the map to decide whether to cycle back down the A855 to meet Graham (I did not fancy doing the long descent into Uig and then coming back up it again later to meet Graham, when he rode up. Good timing! After a photographic session, we rode down into Uig for lunch. I took a short ride back towards Portree during the afternoon, and then we simply relaxed and waited for the ferry. We were pleased to be allowed to take the bikes down the pier well before the ferry arrived, while the motorists waited in the holding area. The time taken to unload and load the ferry was remarkably short, and we left exactly on time, and after a most enjoyable crossing - calm sea, bright early evening sunshine and some wonderful views at the beginning and end - we arrived a few minutes ahead of schedule just before 8:00pm. Cyclists were allowed off last, after the cars, so we got more time on the ferry overall than the motorists, and we then made our way to the B&B, taking one wrong turn on the way. It was getting a bit late now - about 8:30 - so we had dinner (expensive but excellent) at the nearby Harris Hotel, after which we successfully negotiated our way round some drunken yobos in the middle of the road on our way back to the B&B. As had become usual, I had trouble getting to sleep, but eventually had a reasonably good night, which was a relief as Sunday was the day for the biggest ride yet. 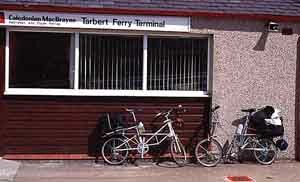 Sunday turned out to be another fine, sunny day, and we left Tarbert at about 09:45. It soon became apparent that we were cycling into the wind, and despite continuing sun, this made it feel quite cool - I found a waterproof jacket was necessary, and even on the climbs I did not feel too hot in it. More significantly, though, the wind made riding much harder work, and except on a few of the steep downhills, this meant pedalling all the time. Unfortunately there did not seem many downhills of any description, and we certainly seemed to climb a lot more than we descended. The first stages of the climb out of Tarbert were particularly hard going - continuous climbing, with some steepish parts which, due to the wind, were quite taxing. I walked a couple of stretches, and only used either bottom or second gear for what seemed like over an hour. Although conditions eased after the first 20Km, there was still a good deal of climbing, and the wind to contend with. As we gradually got closer to Stornaway, we expected to start descending, but somehow we still seemed to keep having to ride up hills - I can only assume that the headwind was responsible for the sensation of climbing all the time. Disappointingly there was quite a lot of traffic by late morning, and when we finally did descend into Stornaway (and it seemed quite a short and gentle descent) there seemed a number of noisy and aggressive cars and motorcycles around. Eventually we located our B&B, and retired to our rooms to rest before an evening meal. The ride had been only 58Km, completed in 6 hours - I hesitate to call this a leisurely pace as it was hard work, but we certainly weren't racing, as the figures show. Monday was yet another fine day, but we had planned only a fairly short ride after the hard work of the day before. 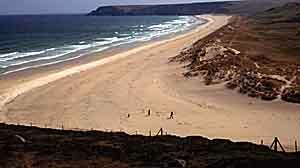 The intention was to follow the B895 to where it finishes and becomes a walk towards Ness. However, the best laid plans of mice and Moultoneers... As soon as Graham started pedalling as we headed into town to pay a quick visit to the Tourist Information Office, there was a worrying rattle/scraping sound, as though the chain was fouling something once or twice per pedal rotation. A careful check showed nothing this simple, and was followed by a more detailed investigation. This brought to light the fact that the rear rack strut had been fouling the rear brake at some point - clearance is a bit limited here, and the brake lever had a severe dent worn in it, and the strut also showed marking. As far as I know this is not a problem which has affected any other NS models, and it might be influenced by the fact that Graham had specified Shimano 105 components to the dealer, rather than the more usual Dura Ace - further investigation will be needed to identify the cause. The nut holding the hydragas valve in place was also loose. There seemed excessive play in the rear wheel bearings, and some wobbling of the gear cluster, but in the absence of cassette extraction tools and cone spanners, there was not much we could do about this. With the back wheel out and the rear mudguard and racks removed, there was no other sign of rubbing or any other problem, so we put it all back together and adjourned to the local cycle shop for help in adjusting the rear wheel bearings. Initially we thought this had done the trick, but very soon it became evident that there were still some potentially unhealthy noises coning from the back while pedalling under load. Therefore the original plans for the day had to be modified - we had already spent 2 hours trying to resolve the problem. Graham returned to Stornaway to consult the bike shop again to see if they could spot any source of the problem which had so far eluded us, while I went on to do the planned ride (see picture above right of deserted, sun drenched beaches - sheltered just here, but with a cold wind elsewhere!). Although I was riding into a head wind, at least this time I had a following tailwind on the return section, and overall it was quite enjoyable, especially at the furthest point and on the wind assisted return, though worrying about Graham's Pylon did detract from the enjoyment. I covered 52 Km in the 3.5 hours, with a couple of photographic stops at the most distant section. When I got back Graham reported that the LBS had been unable to find any other cause for the noises, so we would press on and hope for the best, and then investigate more fully after the ride. Equally unwelcome was the news that there were no B&Bs available for Tuesday night in the northern part of Lewis, where we had been planning to stay. 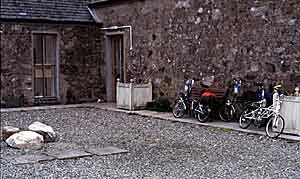 Apparently filming on the island had absorbed a large proportion of the B&B space normally available. This called for a rethink of our plans for the next few days. After considering a number of options, we decided to ride as Barabhas on Tuesday, return to Stornaway for the night, and then take the bus to Tarbert, and stay for a couple of nights south of Tarbert, where, after a struggle, Graham was able to locate a B&B. As it was a rather remote area we were heading for, we stocked up with rolls, cheese, crisps and apples at the local Coop, and then set off along the A857 at about 10:00am. The road climbed relatively easily for some way, then levelled out. It was a little bleak on the moorland up there, but the riding was pretty effortless, even though the very gentle wind was probably slightly against us. It was quite chilly and grey - not a bad day, but not as good as the previous ones. At Barabhas we went down to the beach with binoculars, and also took some photographs, and then decided to separate, Graham riding back, while I opted to go on a bit further towards Ness. In the end I got about half way there (Mealabost Bhuirgh), and then stopped and made use of a shelter to keep warm while eating my light snack lunch. On the way back I decided to stop at the only cafe I had noticed on the way out, Morven. After riding down the drive I was just trying to decide where to put the bike when two Bromptons rode up (see picture right)! 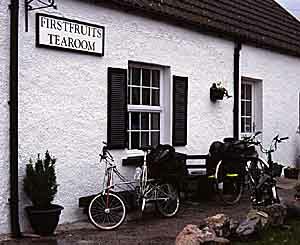 They were not FS members, and had come up from Yorkshire, and were touring with small rear bags on their T5s. After a delicious cup of coffee and a scone, I made my way back to Stornaway. This was quite similar to the outward ride, with fairly gentle steady climbing followed by a faster descent. At the last cattle grid, where I dismounted and pushed across, I noticed some broken red plastic and a squashed AA battery, and had a suspicion it was Graham's rear Vistalite. On returning to the B&B, Graham confirmed that it was - he had heard the lens come off, but as he walked back to pick it up, a passing car managed to drive over it. He hadn't seen the Bromptoneers, but had encountered someone on a Windcheetah recumbent tricycle (we had noticed him briefly on the way out as well), and had stopped for a chat. Although the Pylon was still rattly under load, the adjustment to the rear wheel bearings seemed to have removed the most pronounced and disturbing noise, and there were no further worries about it - though I did take the opportunity to tighten the Carradice SQR attachment, and shave a little off the plastic coating, which was making fitting and removal of the bag a bit difficult due to the excessively tight fit. My distance for the day was 65Km, a very easy distance in these conditions. The plan for Wednesday was to catch a bus to Tarbert at 10:00, and then make our way south to the next B&B. As this was a leisurely schedule, we ate (and drank) heartily at a very nice Chinese restaurant is Stornaway, where the waitress had an interesting accent to her English, a combination of Chinese and Scottish. Wednesday dawned rather grey and dreary, with signs of rain in the air. We made our way on good time to the bus terminal, where our Moultons were loaded into the rear boot of the coach to Tarbert. Just about all the bus/coach routes will apparently carry bicycles without any fuss, and there was no need to do any more than take the bags off the back before loading. The coach left bang on time, and after one other stop in Stornaway, proceeded all the way to Tarbert without once picking up any more passengers. Rain fell quite heavily during the ride, so we were glad to have chosen the integrated transport option for this stage of the journey. It is difficult to judge from the coach, but it seemed that our impression that there are harder climbs from Tarbert to Stornaway than on the return journey were correct. Although there was a little rain falling in Tarbert, conditions were much better than for most of the coach journey. We stopped briefly in Tarbert at a very pleasant and popular small cafe, and while we were there, another Brompton arrived. These Bromptons get everywhere! We finally started our day's cycling at about 11:45 making our way towards Northton, where we had B&B booked for two nights. The road started with a very steep, but mercifully short climb, but we were riding into a chilly headwind (hence the jacket and rather grim expression that Graham is wearing in the picture, right), and the road undulates most of the way, with some fairly tiring climbs, at least given a headwind. The scenery was superb on this route, much more interesting than in the previous few days. Although the weather offered more interesting cloud than the very bright sunshine and cloudless skies of recent days, the ran and murky conditions were not very favourable for photography, though in only slightly different conditions there would have been an embarrassingly wide choice of photographic subjects. Nevertheless, we did stop several times to take pictures. As we got nearer to Northton, there were some lovely beaches and rock formations, and though we stopped for photographs several times, there were many pictures waiting to be taken which we missed. Just as we saw a rather unwelcome steep hill ahead of us, we reached the turning to Northton, and quickly reached the B&B, where we were warmly welcomed and offered tea, coffee, home made cakes etc, and shown to our excellent rooms. There are no eating establishments in the vicinity, but our host discussed our meal requirements for the evening and the following one, and then proceeded to spend the intervening time - a couple of hours - preparing our meal for us. She also offered to put our washing through her machine, an offer we gratefully accepted. This was one of our shortest cycling distance days, but we felt we had lost nothing in the circumstances by using the bus - this was a holiday involving photography and cycling, not some form of cycle endurance test, nor were we setting out to prove anything to ourselves or anyone else. The section we did ride was only about 32Km, but it was most enjoyable, and having time to do this comfortably, and have time to stop to take pictures, was very much part of what makes a holiday enjoyable for both of us. There was some rain during Wednesday night, and it was a rather gray and slightly damp morning on Thursday. We had planned to ride to Leverburgh and then on to the end of the A859 at Roghadal, and then follow a minor road along the east coast to rejoin the A859. However, this would have been quite a long ride, and in view of the weather, and in particular a strong, cold wind, we modified the plan to just go to Leverburgh and back, with options to extend it depending on conditions. It was soon evident that the wind was going to make the return journey very hard work, especially coupled with the undulations. Bottom gear was brought into play a number of times on the outward journey, at least on my NS, on which the wind was behind us. 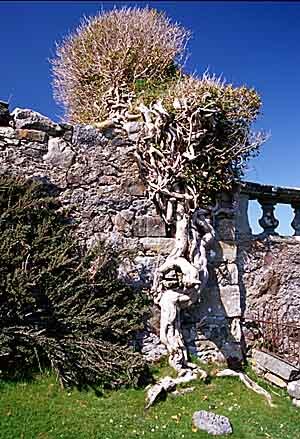 At Leverburgh we took a side road towards Roghadal, and where it ended we turned back. Graham decided he would return to Northton, but I fancied riding a bit further, so I went on ahead. When I got to the A859 again I initially turned right towards Roghadal again, intending to explore at least the first part of the east coast road. However. the prospect of a steep climb was daunting, so I turned back, with the intention of riding back along the main road past Northton and on to some rather striking beaches we had seen the previous day (see picture below). The journey back along the A859 was certainly hard work, at least the first part of it which was straight into the wind. On one long climb it took we an embarrassingly long time to catch and pass a pedestrian. When I reached the beaches I stopped to take photographs, before making a very rapid return, with the wind behind me and more downhills than uphills, and got back to Northton at about 3:30. On the way to the B&B I passed Graham's Pylon parked outside a house, where he had apparently been invited in by a couple we had met and talked to just as we were leaving in the morning. I went straight to the B&B, where cakes and tea were immediately provided to revive me. After half an hour or so, I took a short walk to fill in time, and of course wrote up this report. My cycling distance for the day was a modest 44Km - a comfortable distance for the conditions. I did also walk about 16Km around Northton, both for the pleasure of walking and the scenery, and to look for photographs. After all the exercise the previous day, I slept soundly, and getting up was rather more of an effort than usual. It was a slightly grey morning, with the odd very minor shower, and the plan was to return to Tarbert and catch the 16:00 ferry to arrive at Uig at 17:30, with B&B booked at Kilmuir House. In view of the weather, Graham opted to take the bus - and had the same driver who had taken us from Stornaway to Tarbert - while I set out at about 10:00 for a leisurely ride back to Tarbert. Graham's bus, leaving a bit later, passed me at about 1/3 distance. Riding into the wind was fairly hard work, but a combination of road and wind direction fortunately meant that I was not doing this all the time. The long climb back over the mountains proved much less of a problem than I had expected, due to the combination of a following wind and good grading of the road, and most of the climb was done in 4th gear, dropping briefly to 2nd on a couple of stretches. Perversely, the subsequent descent was much less pleasant, with a gusting 45 degree head wind, which both made it necessary to keep pedalling and presented something of a hazard due to the risk of being suddenly blown off course. As light rain began to fall at this stage, my hopes of getting some photographs during the mountain section were dashed. I had actually arranged to meet Graham at the ferry terminal, but I arrived half an hour early, despite having deliberately ridden rather slowly most of the way. We killed time waiting for the ferry by wandering around Tarbert taking pictures. The ferry once again left on time, and after a smooth crossing (though not quite as smooth as on the outward journey) we arrived in Uig. As we were not sure about where we might get dinner near our B&B, we ate at the restaurant at the pier in Uig, and enquired about the location of our B&B. To our consternation we found that it was 5 miles outside Uig along the A855, which involved a formidable looking climb. 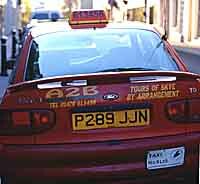 Just about then a taxi, based on a 'people carrier', pulled up outside the restaurant, so Graham rushed out and ascertained that it would take us to the B&B later. In the end I opted to ride, while Graham and the Pylon used the taxi. In fact the wind direction and grading of the hill made it quite an easy climb, followed by a generally fast downhill ride to Kilmuir. I was somewhat puzzled that the taxi did not pass me on the way, and even more surprised therefore to find Graham already at the B&B when I arrived - apparently the taxi driver knew a short cut on the way out of Uig and had thus got ahead of me without passing me on the road. My distance for the day had been only 42Km, taken at an exceptionally leisurely pace - very easy riding. Up to this point our B&B arrangements had not caused too many problems - up to and including Stornaway had already been arranged and booked by Peter Evans, and Graham had managed to find the excellent accommodation with Mrs Morrison in Northton. 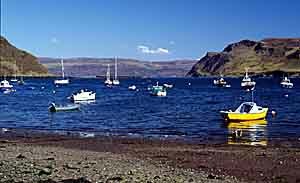 A concert had, however, made accommodation around Portree difficult, and we had had to contact Peter again to ask him to help us to find accommodation at Kilmuir and after. Although it was possible to sort out B&B at Broadford and then Inverness for the return, we were left with a problem for Saturday night; we managed to book one room at Portree, but the second room was uncertain. I wasn't too keen on cycling over to Portree and then having to search around for a room, especially given the knowledge that the concert meant that most places were booked, so I decided that I would cycle over to Portree with Graham, then return to Kilmuir, which seemed a superb location and extremely nice B&B, and then make the long ride from there all the way to Broadford on Sunday, catching Graham somewhere along the way, or at Broadford itself. That would be a longer ride than was perhaps ideal for me with a fully loaded bike, but the forecast was good, so I was willing to tackle it. I was also conscious that on Saturday I would have been doing a 100Km Brevet Populaire at Meriden had I not been here, so I should really be doing a longer ride at this point anyway. Saturday dawned grey and misty, with some moisture in the air, but, supported by the weather forecast, we expected an improvement later in the day. Unfortunately this never materialised, and we had short sunny intervals and a few light showers throughout the day. Graham and I set out together, and after a hard ascent followed by a fast descent into Uig, we headed towards Portree on the A87, into a headwind. At about half distance we separated, as I needed to press on as I intended to go to Portree and then loop back to Kilmuir via Staffin and Duntulm, while Graham, who was only going as far as Portree, did not want to get there too early, and so needed to slow his pace. The A87 to Portree presented a number of interesting uphill stretches, made more significant by the constant headwind. I stopped briefly in Portree to use a cash machine, and then started on the return loop to Kilmuir. This middle section of my ride afforded me a tail wind, and this made this section a good deal easier than it might otherwise have been. I reached the Glenview Inn (where we had stopped on our outward journey) just outside Staffin at about 1:30, and stopped for a bowl of soup, a scone and some coffee. I certainly felt in need of something to replenish my energy reserves, but as always I found that any food consumed during a ride seems to sit heavily on the stomach later, and is a mixed blessing. The Glenview is certainly a good place for a stop if you want one though. Rather fortunately my stop coincided with a heavy shower, which more or less cleared by the time I left. Unfortunately though I soon found the wind was either against me, or there was an uncomfortable blustery cross wind - much worse than when we rode this way a week earlier. After passing Duntulm I was on the road Graham had taken to Uig a week earlier, but which I had missed by going back to Staffin and taking the minor road across the mountain to Uig. Although not quite as steep as the minor road, this still presented quite a challenging climb, and I was glad that I had a lighter load today, clothes, some camera gear (including the tripod) and the computer having been left at Kilmuir House. I arrived back there at almost exactly 4:00, with exactly 80Km on the speedometer, feeling quite tired, though not completely exhausted. After a refreshing cup of tea it was time to do my daily work, ie prepare the day's report, on the Psion. Incidentally, on my way out of Portree I was stopped by a car driver who had passed me a little earlier. 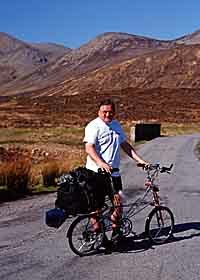 He was Gordon MacQueen of MacQueens (www.macqueens.com), a Canadian who was investigating possibilities of organising cycle tours to and around Skye, and he had decided I looked like an enthusiastic cyclist whose views on cycling on Skye were worth canvassing. Sunday morning offered rather better weather than the previous day. I had arranged to meet Graham at Skye Golf Club, between Portree and Broadford, before 1:00, so I left Kilmuir House at 09:00. Much to my relief, there was almost no wind as I rode towards Uig, unlike the previous day. The pleasant conditions continued all the way to Portree, and made cycling with a full load easier than it had been the previous day with almost no load. Unfortunately leaving Portree the stronger wind started again, and of course it was a headwind. I found it hard going for the next 15Km - and Graham later reported similar experience. The last part of the journey to the Golf Club saw some easing of the wind, and I arrived there at about 12:15, to find Graham already there and tucking in to some refreshment. After consuming a very reasonably priced light meal, we set off along the delightful coastal side road again, thus missing the traffic (which included rather a lot of very fast moving and extremely noisy motor bikes) and the worst of the hills. On rejoining the main road, we paused briefly on a couple of occasions for photographs, and also to take a look at The Skye Picture House, where photographic workshops take place several times each year. 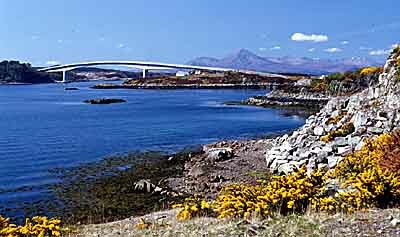 Then it was on just past Broadford to the B&Bat The Sheilings at Harapool - run by the people who operate the Serpentarium 50m up the road. This was a nice location just off the main road, and we had a good meal in the pub just along the road before retiring for a good night's rest. This was my longest cycling distance day of the tour, at 80.5Km - longer than the previous day, but less tiring due to less wind and less hills. Monday was our last day in Skye, and we only had to ride from Broadford to Kyle of Lochalsh to catch the train - just 13Km. We arrived at the station an hour and a half early, intending to buy tickets, book the bikes on the train etc and then have time to wander around for a while. Unfortunately the station ticket office was closed, and remained so until the staff arrived on the incoming train, so we hung around the station for over an hour, and did not manage to do anything useful. We got the bikes on the train OK, though there was some tut-tutting about the fact that we had not booked them the day before - we tried, but they were closed for bookings on Sunday! Later on the train journey two other cyclists boarded, who had reservations; the train crew had not known about them at the start of the journey - perhaps fortunately, or I might have had to separate the NS and find out if it would be acceptable in this form, and not bagged, as hand luggage. After a most enjoyable train journey - superb views - we arrived in Inverness in the middle of the afternoon, booked our bikes on the train for the next day, dumped our belongings at the B&B, and mooched around the town until it was time for the evening meal. Distance for the day was a paltry 15Km. As we were catching the 07:55 from Inverness, an early start was needed on Tuesday. We arrived in very good time and loaded the bikes, but the train then retired to the depot for adjustments, but was back in time to depart only a few minutes late. Although we caught up the lost time, further delays later in the journey, and more adjustments at Newcastle, meant that we arrived at York 25 minutes late. I thought this would mean I would have missed my connection to Birmingham, but this was also late, running behind our delayed train, so I had 3 minutes to spare. The train was running with only 4 carriages, but nevertheless there was still room to get a seat, and the NS was the only occupant of the luggage van. Hauling the bike on the train I dislodged the chain, but decided to leave fixing this until later. Once underway, there was an announcement that the train would terminated at New Street, rather than going on to Bristol - not a problem for me, but naturally very bad news for some of the passengers. This stage of the journey was rather boring after what had gone before, especially as the train seemed to travel exceptionally slowly nearly the whole way. I got home just in time to get some milk before the nearby shops shut, having ridden only 3Km in the day. We had been exceptionally lucky with the weather during the two weeks - bright and sunny for much of the time, a few cold headwinds, and just one day with a few short showers. We had some excellent B&Bs, and none that were bad, and though the conditions were either over bright or rather grey for ideal photography, we still took lots of pictures. The cameras performed faultlessly, and the Psion Series 5mx allowed me to write draft reports of our activities daily. Both bikes had one problem each during the tour, which was disappointing, but this did not significantly interfere with the holiday. Despite their narrowness and relatively thin rubber, the Continental GP tyres performed excellently - no punctures in a combined total of 1000KM, and the tyres on both bikes still show no wear after considerably more distance than was covered during the tour, so life in terms of tyre wear should be good. The lack of rubber, not just tread but also side walls, suggests that it might be vulnerable to cuts, though we haven't experienced any. For touring I would prefer a slightly beefier tyre, which would probably be less skittish on loose surfaces, but the Continental GP certainly seems a good performer, and I have no complaints about it. I was rather disappointed that we had some problems with the bikes - it certainly gives me no pleasure to report such problems, still less to have actually experienced them! A few days reflection, however, helps to put them into perspective. The mudguard failure on the way to Birmingham was an upset I could do without, and the potential for the front wheel locking in such circumstances - fortunately it didn't on this occasion - was worrying, and makes one less confident about cycling, especially on any machines with tight mudguard clearances. The alternative of cycling without mudguards is fine if the weather is good, but very unpleasant on most bikes if it is wet or muddy, and of course mudguards are compulsory on most Audax events, though whether you would be disqualified if one broke during an event and you survived the experience I am not sure. What was rather disturbing was that I didn't know for certain why the mudguard failed, and this left me worrying that if I replaced it, the same could happen again, perhaps with worse consequences. My guess was that the vibration induced by the bump caused the stays to flex, and the securing nut to hit the tyre. 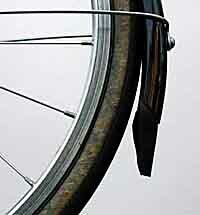 The mudguard clearances were certainly small with the original specification mudguards, and the nut projected several millimetres inside the mudguard. I noticed the mudguard clearances on Graham's Pylon were substantially greater - not enough to fit different tyres, but a much more realistic clearance for the Conti GPs for use on rougher surfaces. Following my report of my problems to the Moulton factory, I was sent, by return post, new front and rear mudguards and stays to the latest specification, as fitted to Graham's Pylon. Though these still do not allow the use of any other tyre - a constraint imposed by the (excellent) short-drop Shimano Dura Ace calliper brakes - these now provide what I would regard as a very generous clearance with the tyres. In general terms, I'd like more tyre choice, but the performance of the Continental GP tyres was excellent (skittish on loose surfaces as one would expect, but good for punctures and wear), as had proved the case on my other tour a couple of years ago. With these latest mudguards, my concerns are eliminated, and of course the ride comfort provided by the Moulton is especially welcome for a longer touring ride such as this. The factory suggests that anyone with the earlier, small clearance mudguards, might wish to turn the mudguard stay fixing bolt around, so that the bolt head is inside the mudguard and the nut is outside - this increases the clearance by 2 or 3 mm. If you have these rather close fitting mudguards, another possibility is to contact the factory and discuss changing the mudguards and stays for the new specification version with the larger clearance - this was done without any quibbles in my case. I have worked for many years professionally in the field of manufacturing business improvement; in the course of this work, a key message which we struggled to put over to companies was that not only do they need good designs and manufacturing facilities, but they need a culture of encouraging continuous improvement - never be complacent about the existing product. While I would personally have preferred to have had larger mudguard clearances on the NS from the start, it is very good to see Moulton respond positively to suggestions and feedback from owners, and though most owners were untroubled by the tight fitting mudguards, or even liked them for their appearance, the clearance is now increased to satisfy even previously critical owners such as myself. 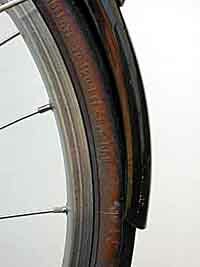 Above: Left - new front mudguard and stays, showing good clearance (the poor condition of the sidewall of the tyre is also discernable). Centre - old rear mudguard, with limited clearance (the old front mudguard had a fraction more clearance, but still limited). Right - new rear mudguard and stays, showing there is now ample clearance. With a fully loaded rear bag, the suspension of the New Series continued to perform well, and undoubtedly made the tour much more comfortable and less stressful than it would have been on most other bikes. However, getting out of the saddle - not just to honk, but when starting from a standstill - is to be avoided, as there is a distinct sense of the tail wagging the dog. This happens with any bike with a big load on the back, but my initial suspicion was that the way the carrier is cantilevered from very forward mountings on the NS cannot help in this respect. Subsequent rather imprecise measurements of the degree of movement which occurs on the rear carrier of the NS show that it is in fact no more than an AM Moulton, and better than that which can occur on the carrier of many other conventional and folding bikes, so probably my impressions have more to do with the relative infrequency with which I ride such a heavily loaded bike of any kind. The NS in its current form is a fine machine, but it is probably more intended for, and suited to, day or weekend outings with a lighter load - I'm sure I'm not alone in hoping that one day we may have a 'real touring version', recreating the spirit of the Safari and Marathon names. I think that if the idea of a Moulton appeals for longer, more heavily loaded, outings, then one of the AM or APB models is currently more suitable than the NS - apart from anything else, they offer front carriers, which, at least at present, are not available for the NS range. Certainly Moultons are outstandingly attractive for this sort of use, with a supremely comfortable ride, effective and efficient integrated, light, luggage systems, low step-over height (a particular benefit when heavily loaded with bulky luggage) and, especially in the case of the AMs, great strength and light weight. Although Moultons don't fold, most are separable, and it is reassuring to have this option available should the need arise. I'd have to say that at the time of, and immediately after, the mudguard problem with the NS I felt that this put it rather in the same category as I placed the Compaq iPAQ personal organiser a few weeks ago - a very advanced design, but perhaps a little fragile in some respects (ie the mudguard). Of course, some people will put up with a few shortcomings in view of the many excellent features, and after my NS had performed so well for the rest of the tour, I felt much more inclined to this view myself. Readers may have noticed that despite my earlier criticisms of the failings of the iPAQ, I'm using it again now (though the Psion Series 5mx was the machine chosen for this outing), and after sober reflection, and the fitting of the current specification mudguards, with their generous clearances, the NS has come back into favour again with me - and may well be back in use for the next touring holiday in June. The fine weather certainly made for pleasant travelling and some good views, but bright sunshine like this is not ideal photographically, especially for some of the monochrome work we had in mind. Personally most of the pictures I took in the end were colour snapshots. The Pentaxes - MZ5N and Z1 - gave no problems, though in retrospect a different selection of lenses would have been more appropriate for what were generally snapshots: I took a 70-210 zoom plus 28, 40, 50 and 100mm prime lenses. A 28-105 would have been adequate for most of the pictures, perhaps with a 70-210, and would have been lighter and less bulky. The tripod was also a heavy and bulky item which barely got used. Graham's choice of the Hasselblad XPAN was very successful - there were many panoramic opportunities, and Graham managed to create some excellent images with it, and also the medium format camera he took. I have just read the report by Michael Reichmann on his excellent Luminous Landscapes web page (http://www.luminous-landscape.com) about his recent trip to Tuscany, and I think it has helped me to identify my camera uses more clearly, and distinguish better between 'travel photography' - which, despite my ambitions before the tour, is what my Skye trip really was - and 'landscape' photography, which is what I hope my next holiday will involve. On the computer side, Graham's Compaq iPAQ lasted the journey with only light use, and the Psion Series 5mx got daily use by me in preparing an outline of this report and recording daily distances etc. It is compact and has a good keyboard, though the screen is terrible, and the ability to back up material on a standard flash card is reassuring in this situation. The Z1 camera required a new battery during the trip (the old one had been in for a long time, and I had a spare), and the Series 5mx also needed a new pair of AA cells - I had a spare set of lithium ones, as I knew that the set fitted were over half way through their life. Would I do it again, and if so, what would I change? Most definitely I would do it again - wonderful country and a great route. Graham made an excellent travelling companion, with our shared interests and reasonably similar cycling pace. The Psion Series 5mx was just right in terms of facilities and size and weight, and there was only one occasion when I missed the ability of the iPAQ which would also have provided some suitable music in the evening before going to sleep. I certainly could have reduced the photographic gear for this trip and this weather - I'd be tempted by an XPAN such as Graham was using, with a 35mm SLR and 28-105 zoom as back up or for shooting colour or mono (opposite to whatever was in the XPAN. I think I would forgo the tripod too - a very important photographic accessory, but rather a lot of trouble on a cycling trip. On the cycle side, I'd perhaps opt for an AM Moulton, which would give almost the comfort of the NS, but with rather better luggage capacity/weight distribution, as it can also take a front carrier. With the new mudguards, though, the NS might still be the chosen machine. Overall performance, ride comfort, weight, luggage capacity etc all make the Moultons excellent for this sort of use; though they don't fold, we didn't need such a facility, and the separability would probably be sufficient if the need arose for more portability - though this is not nearly as convenient with the Pylon as with the 'standard' NS and AM models. Finally, I'd like to express my thanks to Peter Evans, who made most of the arrangements for this trip, but was unable in the end to go himself. He also very kindly helped us to locate some additional B&Bs during the latter stages of the trip.